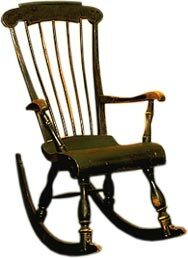 As I sat with my tired little boy today and began to rock him, my mind began to wander... and for the remainder of today I have just thought and thought and thought about this theme... the Rocking Chair. Just bare with me. I have loved rocking my sweet one since the day he was born. Actually, I spent many hours rocking him, in his nursery, while I was pregnant. After my brother died, I would spend a lot of time in that room remembering, wishing, crying- alone. I love rocking my baby, in the womb and out. Today I started thinking that I don't rock him enough. 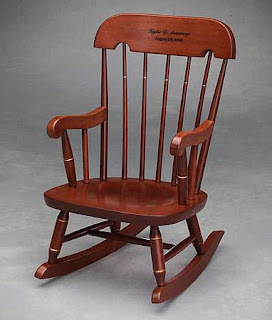 I began to dread when he is too old to want me to rock him... or too big to sit in the rocking chair with me. I am so thankful for these sweet times in the rocking chair. He is so busy now that he really only lets me when he is tired, upset, or sleeping. But I love it nonetheless. Then my mind went to my mom and how she doesn't have that luxury of having her son around anymore to rock even if she wanted, he wanted, or he was small enough. My heart hurt for my mom and made me hold my baby boy even tighter. The pain my sweet mom must have felt when she heard the news that her son, her baby boy, was taken from this world. My mom is truly the strongest woman I know and I hate she had to go through this.. continues to go through this. I hate that all my mom has left are memories of rocking her baby. I know she has such great memories though. My mom, along with all of the other moms that have lost their child way too early in life.... my heart hurts, but I pray they all have great memories of rocking their child. What about those moms that never got to rock their baby? Those moms that prepared for the arrival of their bundle of joy only to have their baby taken from them as soon as they delivered. Or the mom that lost her life giving birth to that baby that would not be able to walk with their mom. Or the mom that never got the chance to truly embrace the joys of pregnancy or dream of rocking their baby. The mom that wasn't able to hold their baby as they grew and rock them to console them, to put them to sleep, just to love them. And my heart hurt. What about the moms that have been able to bask in the greatness of pregnancy and a newborn? The moms that, like me, have enjoyed rocking their sweet one, day in and day out. But the same moms that get the terrible news as their baby is growing that their baby is not going to make it? The moms that have to rock their baby until they can't rock anymore because they don't know how much longer they really have. Again, my heart hurts. What about those moms? What about the women that have tried for months or years to have that baby to rock? Those women that have put their whole being into trying to have that baby to rock- but can't? These women that can only dream of seeing those two lines on a test, seeing their first ultrasound, watching their belly grow, feeling that first kick, feeling the onset of labor, and birthing a baby? 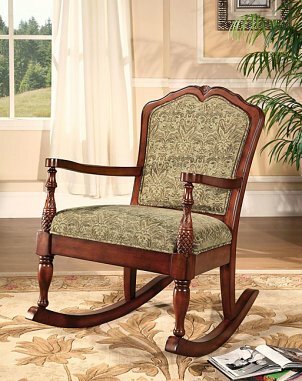 The women that can only DREAM of having that child of their own to rock in that special rocking chair. My heart hurts. What about the women that have lost their sweet husband before they were able to have that baby together. The women that had already planned what their life was going to be like with their sweet man and then he doesn't come home from war, from work, from errands? The woman that will never be able to share in that with the man of her dreams because he was taken all too soon from him. What about them? It hurts my heart. Then my mind began to think about those babies, kids, young adults that have never had the luxury of having a Mommy rock them. Never having a mom that cared enough to treat them the way I treat my baby. To have a mom love them the way I love my baby. To have a mom dote on them like I do mine. What about those babies that grow into adults and struggle on a daily basis because they didn't have a mom like I did, like I want to be? What about those kids? Or the babies that have lost their Mom way too soon... at birth or after and have never been able to have their mom rock them, hold them, love them. What about them? What happens? Then it hit me. It hit me today like a ton of bricks. 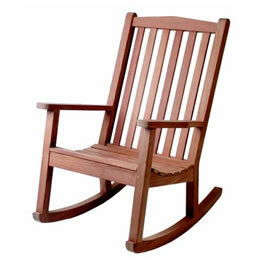 It comes from the song I sang many times in my Youth Choir and Drama "Jesus has a Rocking Chair." How often I forget that. I forget to let Jesus Christ rock me during the good times and the bad times. The amazing feeling I get when rocking my sweet boy is only a grain of what the Lord feels when I ALLOW Him to rock me. Why don't I give up and let Him? WHY do I struggle with this so much? Am I the only one that struggles so bad with this? In each example that I talked about above, I know someone personally that has been there. Did they, are they letting Jesus rock them? Why do I have such little faith? I know that the Lord wants to love me, admire me, dote on me, smile with me, laugh with me, cry with me, hold me, and rock me- just like I do my sweet one. Why is it so hard to let him. My girlfriend has a sweet daughter that rocks herself to sleep. We laugh about it. But I began to think about this again this afternoon... maybe she is just feeling the arms of Christ around her and the comfortableness of Him... as she rocks herself to sleep. Oh ye' of little faith. Maybe I should begin rocking myself to sleep as I pray to the Lord. I am positive that He will help me understand that He is right there with me, with his arms around me, rocking me. The rocking chair is so important to me. I don't think I will ever sit in our rocking chair again without thinking about all my thoughts today. Putting it on paper just does not give my thoughts justice. I have had so many thoughts with it. Jesus is here to rock me. When I feel like I can't go on, that my heart is broken, that I am tired of trying, that I don't know where to turn, HE is here rocking me. I need to feel it. Lean upon Him. Rest in Him. Let Him.